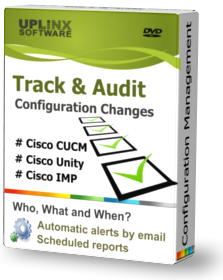 UPLINX Track & Audit automatically alerts Cisco system administrators of configuration changes and enables them to review the changes in their email client within seconds. Time wasting routine reviews are no longer needed and time gaps of not knowing what might have been changed is eliminated. Any configured items on Cisco CUCM, CUC and IMP can be monitored and configured to trigger email alerts to administrators to review and audit any configuration changes. When critical changes occur, the system sends out email alerts containing a list of changes which can be reviewed within seconds from the convenience of your email client (screenshot below). 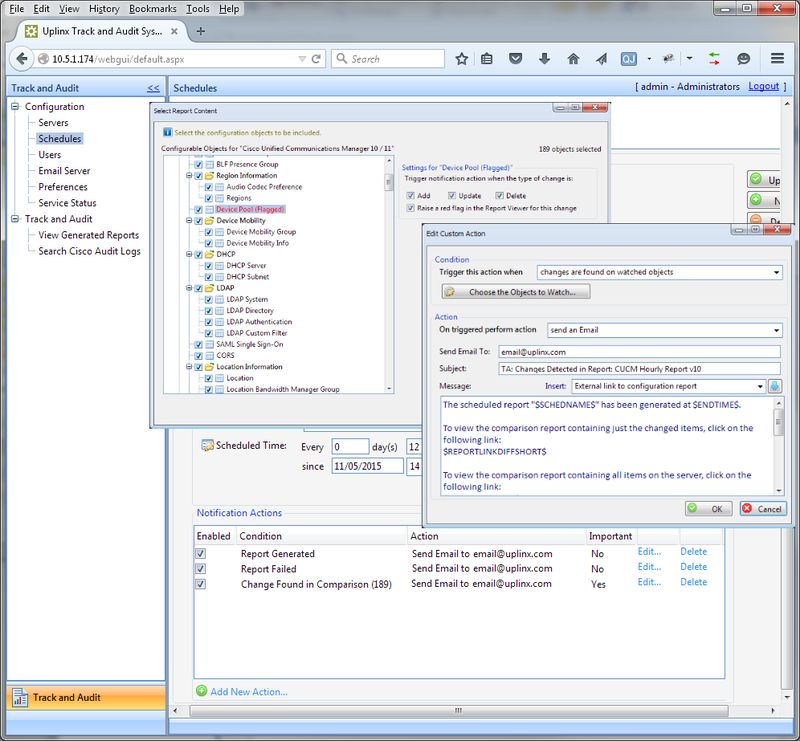 Daily configuration reports enable you then to quickly undo configuration changes that are causing issues. Email alerts can be triggered when any or specific configuration items (such as device pool, CSS, phones, route patterns or voice gateways) change. These email alerts can contain a summary of changes. Optionally, you can receive the details of each change, including the item changed, the time and the user. Critical system configurations such as CUCM route plan configurations can now be closely monitored by defining which configuration items are monitored (such as CSS, partitions, route and translation patterns) and trigger email alerts. These triggers and email alerts can be easily defined on the Track & Audit's web configuration pages. Below is a typical email alert which contains the monitored changes, enabling the administrator to quickly track what has changed in Cisco Unified Communications and who has changed it.